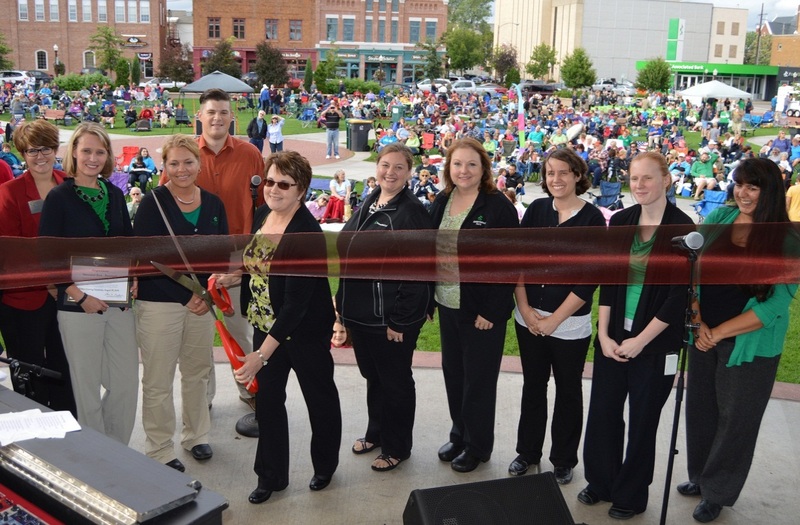 Associated Bank recently reopened its downtown Wausau branch at 400 Scott St. during a ribbon-cutting event on Wednesday, August 19. The reopened branch features an updated design and modern fixtures. The Wausau Region Chamber of Commerce “Red Coats” and 2,500+ people packed Wausau’s 400 Block for the ceremony and a concert on the square that followed. Concerts have been held every Wednesday, from June through August. The final concert for the 2015 season was sponsored by Associated Bank and featured Windsor Drive, a Wausau-native band. During concert intermission, Associated Bank shared the stage with these organizations as they updated the attendees on their missions and goals. Attendees were invited to take Associated Bank merchandise and had an opportunity to talk to on-hand colleagues about the remodel. During concert intermission, three 42” TVs and 50 Associated Bank chairs were given away.